<firstimage=”//static.makeuseof.com/wp-content/uploads/2011/04/creepy_mapview1.png”> Enter someone’s Twitter or Flickr usernames and see everywhere they’ve been and when. If this sounds creepy then it is. Ever wonder how much information geolocation leaves behind? As it turns out, quite a lot. 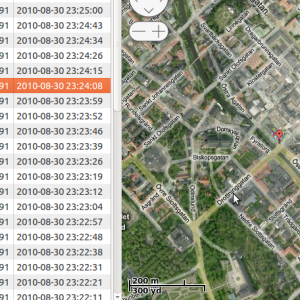 The Creepy geolocation tool [No Longer Available] is a program for Ubuntu and Windows made primarily made to demonstrate just how much information that is, and how easily it could be used for nefarious purposes. Whether you regularly check in at a certain coffee shop or just occasionally take pictures at favorite park and post them to Flickr, you’re leaving behind a tremendous amount of information. There are patterns, and any patterns can be analyzed. Creepy makes this easy, and the results are…well…creepy. A fairly complete picture of where you spend your time emerges, encouraging you to reconsider providing this much information to the open Internet. Launch the Creepy geolocation tool and you’ll be able to add Twitter and Flickr usernames. If you’re unsure of someone’s exact username, don’t worry; there’s a search feature (though using this with Twitter will require authentication). Find the information you need, then provide the usernames. Once you’ve entered the people you’d like to look up, you may end up waiting a while. How long depends on the number of tweets or pictures that need to be analyzed, so be patient. A lot of information is being gathered. Of course, not everyone leaves behind some sort of useful trail. Maybe you do, however; use this program to find out. This program isn’t intended to aid stalkers; at least, presumably not. No, the purpose of this application, like Please Rob Me, a similar program, is to teach people the consequences of leaving too much information about themselves on the web. Far from being concerned about privacy, many people are today broadcasting their every thought and action. This can be fun and exciting, but it can also be used for nefarious purposes. Whether someone wants to rob your house or “accidentally” bump into you at a coffee shop, you could be inadvertently handing them the tools to do so. Everyone knows this in the abstract; a tool like Creepy makes this uncomfortably concrete. What do you think? Does the Creepy geolocation tool make its point well? Are you the sort of person who leaves such a trail behind, and if so were you surprised to see it aggregated? Start a conversation below, because I’d love to be part of it. Explore more about: Flickr, Geotagging, GPS, Online Privacy, Twitter.